When it comes to food labels and marketing, odds are good that true meaning is the opposite of the intended. Next time you see any of these words used on a label or in an advertisement, think of them as a red flag and consider your choice carefully. The term “Natural” is essentially unregulated and therefore meaningless when it comes to food labels. (I’ve written about this before, but it’s become so common that it bears repeating.) 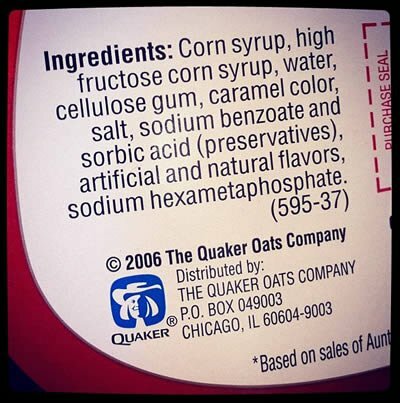 I’ve seen “All Natural” claims on products that contain high fructose corn syrup, preservatives, artificial colors, artificial flavors, and all sorts of other additives-made-in-a-lab that I can’t even pronounce — none of which would I consider even close to what nature actually created. What’s most frustrating is that even though I know this to be true, I still catch myself falling for it every once in a while. The word “natural” is so loaded and so powerful, that it’s hard (impossible?) to break out of that mindset. The best solution? If you ever see the word “natural,” start with the assumption that it’s probably not. I feel silly that I have to even point this out, but “Multi” simply means “More Than One.” So multigrain means you’re getting more than one type of grain. It could be wheat, rye, corn, triticale, whatever — it’s just that there’s at least a teeny-tiny bit of at least two grains in there. It doesn’t say anything about “whole” grain — which is the important part. Here’s how to choose whole grains. According to Merriam-Webster, an Artisan is “one that produces something (as cheese or wine) in limited quantities often using traditional methods.” Recently, Domino’s Pizza started offering “Artisan” pizzas, even going so far as to have the person who assembles all the parts actually sign the box. They even ironically claim “We’re not Artisans!” as part of their marketing campaign (but they somehow still think it’s okay to call them “Artisan Pizzas”). Do you know any truly artisanal food makers who add Sodium Stearoyl Lactylate, L-cysteine, and Silicon Dioxide to their pizza crusts? A better choice: Become your own pizza artisan. The definition of “moderation” is very different from what the food industry would have you believe. Purveyors of processed products lure you in with the notion that you can indulge a little each day and be just fine. In theory, that’s true. In practice, however, it rarely works out that way. The 2005 USDA Guidelines used the term “discretionary calories,” defining them as the extra, nutritionally devoid calories you could safely consume (around 150 to 300 each day [PDF], depending on overall caloric needs), after you’ve already satisfied the rest of your day’s nutritional requirements. The more recent 2010 “My Plate” guidelines use the term “empty calories.” Same concept, but now with a more accurate name. So if — and only if — you ate perfectly healthfully all day long (whatever that means), you could then indulge in just three Oreo Cookies or half an order of In-N-Out Fries, or one can of Coke. In reality, though, most of us (self included) sneak in those empty calories a little at a time, often without even realizing it (ketchup or mayonnaise on a sandwich, a teaspoon of sugar in our coffee, Gatorade after a workout). It’s not just the obvious, added bits, either. That 500-calorie bran muffin? Sure, 300 of those calories might come from good-for-you ingredients (like whole grains) — but the other 200 might come from discretionary/empty butter and sugar. Those empty calories add up so quickly and easily that there’s actually no room left over for that cookie at the end of the day. I’m going to use the Quaker Oats product line as an example here (since PepsiCo is my arch-nemesis); next time you’re at the grocery store I bet you can easily find a ton of similar products. Right at the top of the Quaker Oats website, it says “Wholesome goodness in delicious new ways.” So let’s talk about that “wholesome goodness” Quaker offers. Sure, their unadulterated, plain oats would fit the definition wholesome (“promoting health of body,” according to Merriam-Webster). But the rest of the product line (which is the vast majority of what they sell)? Not so much. Consider for a moment their “Quaker Oatmeal To Go” bars. Sure, the first ingredient is oats. The second ingredient is high fructose corn syrup. The third is brown sugar, and a little further down you’ll find plain white sugar. Odds are high that there’s more sugar than oats in the bar. And then there’s the margarine, made from partially hydrogenated oils, which means it’s got trans fats in it, which have no safe intake limit. Oh, and they also throw in preservatives, artificial color, natural flavors (ahem–also meaningless) and artificial flavors. Suddenly, they’re not looking so wholesome after all. I hadn’t seen this word all that often when it comes to marketing, but when I went to the Quaker Oats website while researching this post, I couldn’t believe just how often they use the words “good” and “goodness.” Of course, it makes perfect sense — just as unregulated as any “wholesome,” it connotes something positive without saying anything at all. I counted these two words no less than six times on just the Quaker homepage alone! It’s actually a fun exercise — click through and see how much meaningless marketing doublespeak you can find on their site. If something sounds really good to you, be sure to read the ingredients. You’ll probably change your mind. I heartily agree with you on this, Andrew. Unfortunately, it’s not solely food that suffers from “meaningless marketing doublespeak’ in our society. It’s everywhere, from the most vital of issues facing us, to the least. I also heartily agree wit you, Andrew. The one that takes the cake for me is “natural”. When I see meat advertised as natural, I have no idea what that means. AHHHHH! I am becoming more and more leery about trusting anything that packages have on them. Including the sneaky ways ingredients are listed. It all comes down to Trust. Seek out small local grocery stores that do the homework for you and you can trust,and a perfect example is Jimbo’s in San Diego. (I have no affiliation)Once you have visited this store with it’s Non-GMO policy,organic,and local produce you will demand more stores with this model in your community. Take some time and browse their site online, and drop by one sometime to take a peek, it’s worth the visit. I’d add “organic” as organic junk food is still junk food. I hear a lot of people using it when they get puzzled or frustrated.